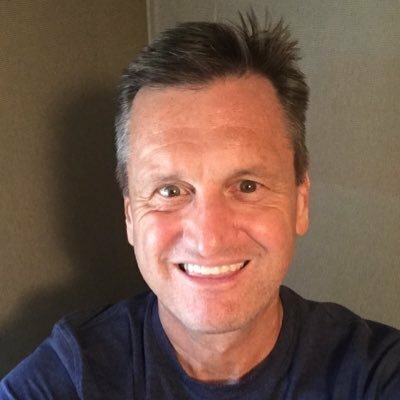 Today, Sen. Tom Davis — a man I greatly respect but seldom agree with — endorsed insurgent John Warren in the runoff against his party’s incumbent governor, Henry McMaster. What grabbed my attention was one of the chief reasons Tom offered: He’s mad at the governor over his veto of the roads bill last year. But unlike my own representative Micah Caskey, who ripped the governor a new one for vetoing the bill, Tom’s ticked because Henry didn’t veto it hard enough, so to speak. In a way, though, both Micah and Tom are hitting the governor for the same thing: Not taking the issue seriously enough, and acting with a disgusting degree of political expedience. Micah was indignant that the governor never seriously offered an alternative to the gas-tax increase. This was particularly galling when the GOP leadership in the House was taking the political risk (by Republican standards) by raising the tax. I think if Henry had been pushing a real alternative, Micah could have respected him more. Tom’s critique is that the governor merely pandered by offering the veto — something with which I think Micah would agree — without caring whether it was sustained or not (or perhaps even wishing it to be overridden, which it promptly was). Both hit the governor for putting his own political advantage ahead of important matters of state policy. Both seem to see him as disrespecting allies and potential allies in his own party, and worse, disrespecting the people of South Carolina. From their perspectives at either end of the GOP spectrum — that of a moderate House freshman and that of the most ideologically pure veteran senators ever to serve in the State House — they’re fed up with the governor’s fecklessness. So both are backing James Warren. 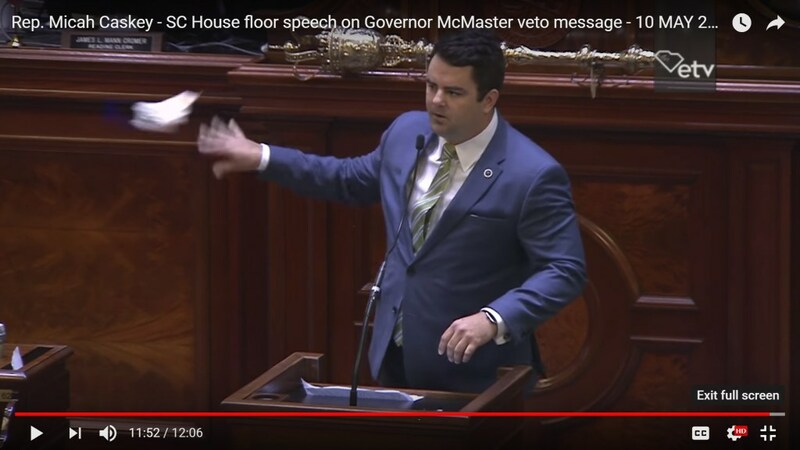 Micah Caskey last year, wadding up the governor’s veto message and throwing it away. What’s Henry McMaster afraid of? Mark Sanford? 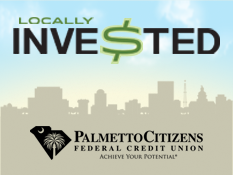 This entry was posted in 2018 Governor, Endorsements, Henry McMaster, Leadership, Legislature, Libertarianism, Micah Caskey, Republicans, South Carolina, Transportation on June 19, 2018 by Brad Warthen. “Greatly respect ” and Sen Tom Davis used in the same sentence. Interesting. This is the guy who connives with every phony libertarian group in the state and won’t be satisfied until the super-wealthy have unfettered control of all public and private endeavors. Feudalism is his favorite form of government. I can’t see consistent loyalty to any extreme ideology being deserving of respect. Force of habit. I’m brainwashed. Tom was always the Good Cop in the governor’s office during the Sanford years. Did you ever watch the series “House?” If Sanford was House, think of Tom as Wilson. I had no idea how ideologically extreme Tom was until he ran for the Senate on his own. When he was in the governor’s office, he seemed like this really reasonable guy who was supporting Sanford out of long-standing friendship. As I say, like Wilson. I’ve just always had a good personal relationship with the guy. I like him and I trust him. He’s a good guy. His political positions make my jaw drop, but he’s just this guy, you know? I’m a proud, unapologetic Democrat and I find it offensive to suggest that simply because I’m a so called “partisan” Democrat that somehow I despise people I disagree with.